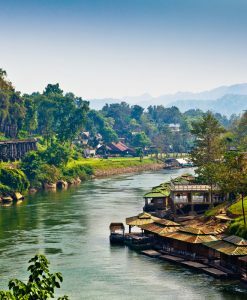 Let’s find here the perfect Kanchanaburi tours and Kanchanaburi day trips to the River Kwai and Kanchanaburi town and province departing from Bangkok. Kanchanaburi is actually about 128 km drive in west side of Bangkok, the wonderful area on the province is plenty of very interesting places such as the famous Bridge of River Kwai, the related war time bulilt Wooden Viaduct, the Hellfire Pass; Elephant Camp is also present in the area as well as the War time Museum and Cemetery in the city. 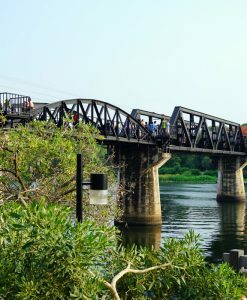 Kanchanaburi is really all surrounded by fantastic and picturesque countryside, many bike trails and a remarkable National Parks. 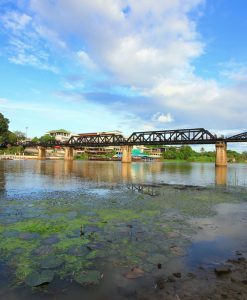 The delightful beauty of Kanchanaburi province and its charming Parks and impressive landscapes made the town and the surrounding such a popular tourist attraction and intriguing experience for day tours. The National Park is blessed with amazing caves, rivers, reservoir and virgin forests. As it became so famous the town was even portrayed in the popular movie “Bridge on the River Kwai”, showing the incredible building of the Burma Railway, forced laborers in World War II under Japanese control were working in camps and construction sites to develop the Railway to Burma, many had to die for the achievement and eventually the railway took the name of Death Railway to Burma. In facts still today all the area is home to various number of museums all dedicated to World War II history. 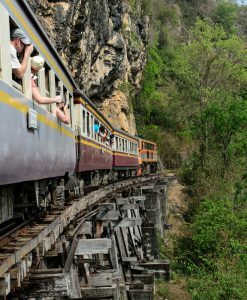 Even more recently Kanchanaburi tours become very popular with backpackers and thousands of visitor in search for its relaxed ambiance and history. 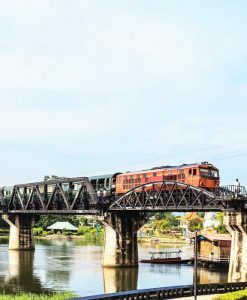 The city of Kanchanaburi now makes a perfect location for day trips, can be reached vary easy with very well organize full day tour from Bangkok.